Since the modeling of AKL FlowDesigner is based on mouse operations, even beginners can master most things by half-day training. It is also easy to make a change on analysis condition, so that you can compare and examine multiple analysis models easily. The following is the operation example of the case the interior of an apartment. 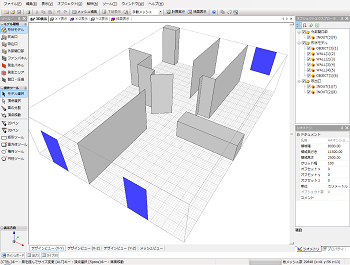 You can import rough image or 2D CAD data to be used as design. It can be imported by mouse dragging. 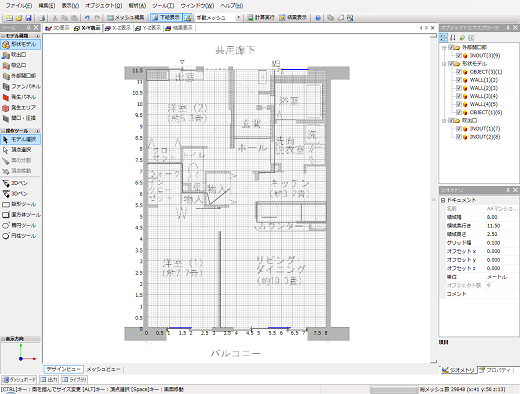 Imported an image to AKL FlowDesigner. Place each object based on the imported image, and then execute the calculation. The calculation of this example takes only about 30 seconds. You can see that heat buildup in the innermost room of this image. You can see that wind does not flow in the innermost room. In case of this model above, whole process from modeling to outputting the analysis result takes only 5 minutes (with about 30,000meshes). Another feature of AKL FlowDesigner is an ability to converge analysis of nonlinear problems automatically, so that you don’t need to adjust parameters manually. It also helps you to make presentations using images or movies of 3D simulation results which have been examine and compared with different models with ordinary computers. It can be applied to a variety of fields depending on the purpose, e.g. from making ideas to full-scale simulations.